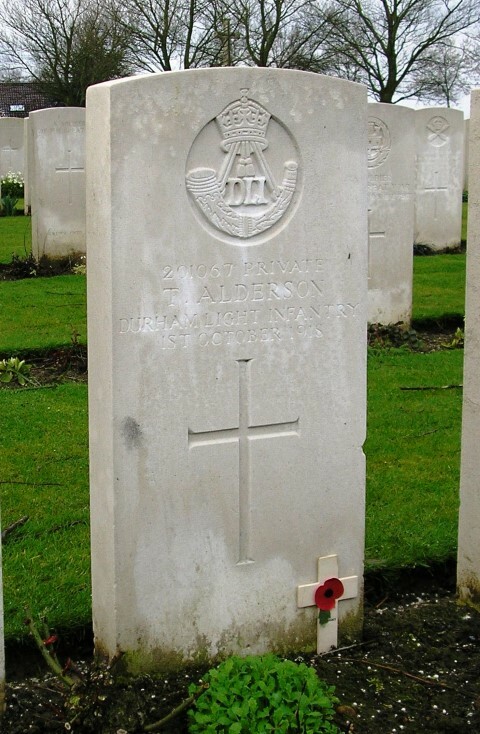 201067, Private Thomas Alderson, 19th Battalion, the Durham Light Infantry was killed in action 1 October 1918 and is buried at Perth Cemetery (China Wall) near Ypres, Belgium. He was 26 years old and is commemorated on the Cockfield and Butterknowle War Memorials. Thomas’ father Luke was born at Arkengarthdale, a lead mining area to the north of Swaledale in the North Riding of Yorkshire and Sarah at Mickleton- in-Teesdale on the Yorkshire side of the river Tees. In 1901 the family lived at Potters Cross in the Parish of Lynesack & Softley where Luke was employed as a colliery joiner. By 1911, Thomas’ mother Sarah had died,  Luke worked as a colliery joiner and 21 year old daughter Dorothy Alice was at home, presumably looking after the house. Thomas aged 19 worked as a coal miner (putter) and brother, John Willie aged 15, was a cartman. The family lived at 3 Gaunless Terrace, Copley. 6 August 1913, Thomas married Edith Blackett at Lynesack Parish Church and they had 1 child, Eva born 8 November 1915. 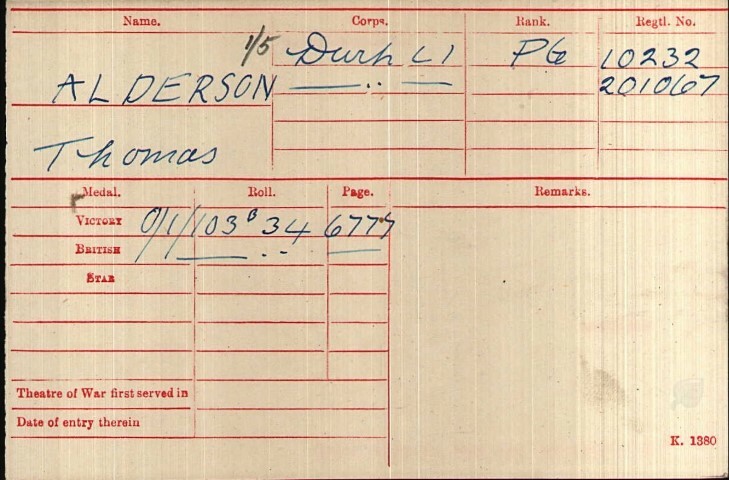 8 December 1915: Thomas Alderson attested and joined the Army Reserve. 18 September 1916: Private T. Alderson was mobilised. He served with the 5/DLI being allocated the regimental number 10232. The 5/DLI was formed in August 1914 at Stockton-on-Tees as part of the Yorkshire and Durham Brigade and landed at Boulogne, France 18 May 1915. It came under the orders of 150th Brigade, 50th (Northumbrian) Division then was transferred to the 151st Brigade of the same Division in February 1918. The 19/DLI was formed as a “Bantam Battalion” meaning that it was for men who did not reach the normal height required by the Army of 5’ 3” – this definition of the battalion ceased January 1917. At some time later, not researched, he was transferred to the 19th Battalion, DLI and was given the regimental number 201067. Private Thomas Alderson was killed in action 1 October 1918 when the 35th Division formed part of the 19th Corps of the Second Army and saw action in the Fifth Battle of Ypres, 28 September – 2 October 1918 as part of the Final Advance into Flanders. As part of the 104th Brigade, 19/DLI took up the advance on the evening of 30 September. With 18/Lancashire Fusiliers on the right they advanced to pierce the well defended switch line running north east to Gheluwe on the Menin road. German machine-guns held up both battalions. Private T. Alderson was awarded the British War and Victory medals. His effects were issued to his widow Mrs. Edith Alderson. 201067 Private T. Alderson is buried at grave reference II.J.4 Perth Cemetery (China Wall) near Ypres, Belgium. He was originally buried elsewhere and was re-interred here. There are 2791 burials. Note: the Cockfield War Memorial records “Alderson Thomas W.” and the Butterknowle WM records “T.W. Alderson” but a “T.W.” living locally cannot be traced thus we assume that Thomas Alderson is the correct soldier.